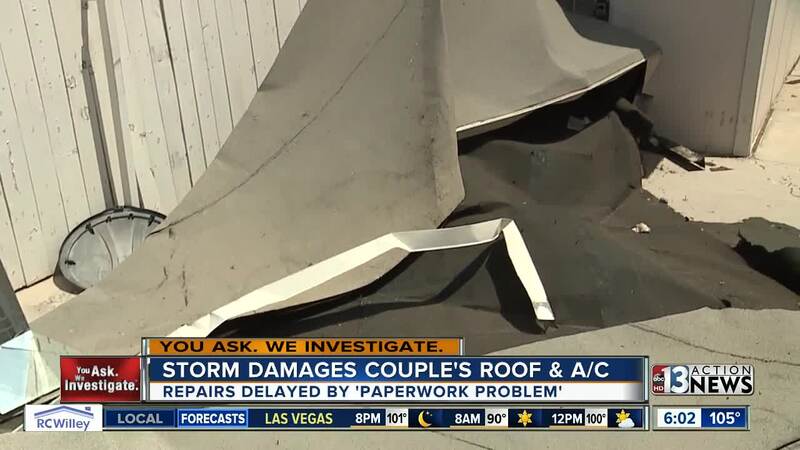 A Las Vegas couple is dreading the threat of more rain after a storm ripped off their roof and caused major damage to their apartment two weeks ago. Amy Ishol said the trouble started back on July 25. "I came home from work a little after 10 p.m. and I could smell [natural] gas," said Ishol. "I walked in the gate and I saw my roof sitting here," she added. Just steps away from her front door, the roof is still in a heap two weeks later. Amy said a closer inspection revealed a huge hole where the air conditioner used to be on the roof. Her neighbor helped her out with tarps to cover up the damage. "We have fans and you just get creative with ways to stay cool," said Ishol. The air conditioner and natural gas lines were badly damaged and have not worked since the storm. "I don't feel like I should have to leave all my belongings and let someone break into my home," said Ishol. "My husband works nights, and I would not feel safe at a budget suites," added Ishol. USA Real Estate and Property Management had Amy sign a "Waiver to Hold Harmless" after she refused alternative lodging at no cost to her. Amy said she is staying in her apartment and wants repairs sooner rather than later. "I was fortunate enough to have someone who cared enought about me to contact you," said Ishol. In regards to the highly unusual weather phenomena that occurred roughly around 12:00am on 06/26/2018, which we now know to be called a micro burst of air. We had vendors out later that morning to access and confirm the damages to the top exterior portion of the building. A claim was also filed with the homeowner’s insurance that morning as well. Please keep in mind that due to the damages three of the units were without Gas, and one was without Gas and A/C. We reached out to all four units that day and offered to place them in alternative housing at no cost to them, until the repairs were completed. Unfortunately three units refused, and all of those three units signed a Hold Harmless Agreement. The fourth unit asked to be let out of their lease, which we approved with no negative recourse to the renter. And are currently helping that renter seek out a new home. They also were offered temporary alternative housing while finding a new home and they refused. We are obligated to wait for the homeowners insurance adjuster and their clearance to proceed with repairs, we again advised all units we would put them in alternative house, and again all three units refused. The insurance adjuster was out at the property with one of our staff members yesterday (08/07) and their own contractor will be onsite tomorrow (08/09) to provide the homeowners insurance adjuster with an estimate. Once the adjuster gives us the clearance the repairs will begin immediately and will be completed promptly. I hope this clarifies that we acted quickly and gave the renter’s options as far as being placed in Alternative Housing at no cost to them during the duration of this issue. While we would have loved to proceed with repairs immediately, we are bounded by the homeowner’s insurance and must wait for their adjuster and contractors. We are working diligently to resolve the above issues within the limitations of working with the homeowner’s insurance company.